By Fletcher Tyrone Wilkins - certified kundalini and meditation and registered Yoga Alliance teacher. He has been teaching in Idaho Falls since 2004 and has been practicing kundalini yoga and meditation for approximately 8 years. A yatra is a physical and spiritual journey meant to elevate you into living your highest vibration and to bring you closer to God. While I was in teacher training in 2003, one of my teachers, Gurmukh Kaur Khalsa, mentioned that each member of our class should try to visit India, the birthplace of yoga, at least once in our lifetime. I remember thinking that it would be nice to visit India, but I was not immediately drawn to visit anytime soon. 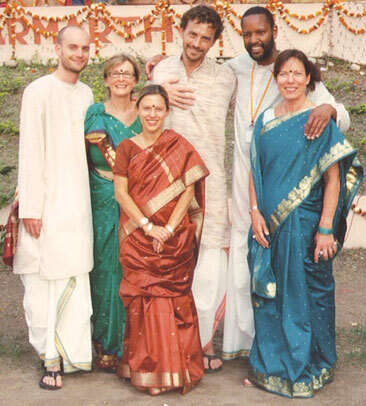 On one of my trips to Los Angeles, I remember being invited to go to India with my teachers Gurmukh and Gurushabd Singh Khalsa, directors of the Golden Bridge Yoga Studio. I said “yes,” that I would go, but as the year went along, I forgot about my agreement. When Yogi Bhajan, Master of Kundalini Yoga and Meditation, left his physical body in October 2004, I remembered my conversation with my teachers. Suddenly, I felt drawn to go to India. There was still room for me to go to India with the Golden Bridge yatra and all preparations for the trip went smoothly. Our group was going to the International Yoga Festival at the Parmarth Niketan Ashram in Rishikesh, India and the Golden Temple in Amritsar, India. The Parmarth Niketan Ashram, the largest ashram in Rishikesh, is located on the banks of the Ganges River (Mother Ganga) in the Himalaya Mountains. The ashram, which has modern amenities, is a spiritual haven and a perfect location for the International Yoga Festival. The festival was attended by over 250 yogis and yoginis representing over 33 countries. Upon arrival at the ashram, our group was welcomed home with beautiful singing by the Rishikumars, amazing children that stay at the ashram. The activities at the festival included morning universal prayers and sadhana, daily yoga and meditation, lectures, daily satsang with ashram president H.H. Pujya Swami Chidanand Saraswati and other beloved saints, and aarti. I felt blessed to start each day in the early morning hours with a room full of devoted yogis and yoginis gathering for group sadhana that incorporated prayer, yoga, and meditation. Sadhana sets your whole day and clears the sub-conscious mind of negative thoughts and worries. I remember crying many times in sadhana as I released thoughts and fears that I had blocked far too long. After sadhana, I was able to have tea, enjoy the moment, visit with friends, and be at peace. There were many high points that I experienced at the International Yoga Festival. One of them was the lecture given by ashram president Pujya Swamiji on the eight limbs of yoga. I have known that yoga is more than asana, pranayam, and meditation. When I heard Pujya Swamiji speak on the eight limbs of yoga and yama and niyama, I felt these words in my heart and experienced them. I was getting what yoga truly means and kept thinking about how right living and right values resonated within me. The Kundalini yoga and meditation classes with Gurmukh were among the most powerful and healing classes that I have taken with her and were another high point. We were outside in the sunshine and connecting with the earth literally in some classes by walking barefoot in the grass. I experienced much healing and letting go of emotions that no longer serve me in the series of classes with her. I found it to be true that the veil is thinner in India. I remember seeing my guides and ancestors during some of the kriyas and meditations. The list of high points would not be complete without talking about Aarti. Aarti is an evening light ceremony held on the banks of Mother Ganga where people from all over the world gather in peace, joy, and reverence. The aarti, an ornate oil lamp, lined with dozens of flames burning in pure ghee, is offered to God. Aarti includes chanting devotional songs and prayer where we give thanks to God for the blessings bestowed upon us that day, as well as symbolically offering light back to God. I found Aarti to be a healing ceremony and felt blessed to be able to take part in the ceremony as a festival participant and invited guest of the ashram. One of the meanings of Aarti literally is “remover of pain,” and I always felt at peace during Aarti sitting on the banks of Mother Ganga or walking in her waters and letting my worries go. I was truly blessed to be at the International Yoga Festival at Parmarth Niketan Ashram as a festival participant and invited guest and I am grateful to Gurmukh and Gurushabd for inviting me to India with them. I met beautiful, friendly, and compassionate people from all over the world who enriched my life for the better. I was in the presence of true saints who are living yoga. I experienced being able to forgive myself and others. After the festival, our group took a train to Amritsar to go to the Golden Temple. That was another beautiful experience to be shared at a later time. My experience in India was worth the long flight time. In India, time had no meaning. I was held in God’s arms and was in no hurry to go anywhere soon. I would recommend taking a yatra to India to anyone because you never know how it is going to change your life. I returned to Idaho more committed to teaching Kundalini yoga and meditation. God Bless you always Yogi Bhajan for sharing these teachings. Even after I returned to Idaho, all I had to do was close my eyes and I was back in India.